The Parrsboro shoreline is perfect for rockhounding when the tide is out. The former shipbuilding town of Parrsboro, tucked away into a corner of the Bay of Fundy, is packed with activities, especially for outdoor enthusiasts, who are drawn by the chances to go rockhounding and fossil hunting. There’s also the excellent Fundy Geological Museum, where you can see some of Canada’s oldest dinosaur bones and if you arrive on the third weekend in August, you’ll find the place packed for the Gem & Mineral Show. In the peak summer season the Ship’s Company Theatre stages plays with a Maritime or Canadian theme. Less energetic souls might just want to watch the world’s highest tides in action, before admiring Parrsboro’s many elegant Victorian homes, a legacy of its bustling marine past. Twice a day, the waters sweep in and out of the harbour, eroding away at the cliffs and uncovering fossils and semi-precious stones like amethyst. The downtown is also attractive, with welcome mats painted on the the sidewalk, dinosaur lights hanging from the telephone poles and a large statue of the Mi’kmaq god Glooscap. Whatever you decide to do in Parrsboro, there are enough sights and activities to keep you busy here for a day, although an afternoon would do if you’re passing through on your way to Joggins or Five Islands. Either way, make sure to time your visit to take advantage of low tide. Otherwise, the only gems and fossils you’ll see will be in the museum. Before you leave, stop by the Parrsboro Rock & Mineral Shop, where the world’s smallest dinosaur footprints are on display. There’s also a strong lobster and scallop fishery in these parts as well as blueberry fields so Parrsboro is a good place to try the local produce. 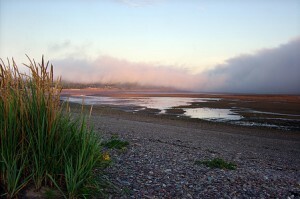 Read more about what to see and do in Parrsboro. Directions: It’s a scenic drive to Parrsboro. Allow 1 hour from Amherst on Route 302 and then Route 2. Extra time is ideal so you can explore the UNESCO world heritage site of Joggins along the way. From Truro, the journey by car takes about 90 minutes on Route 2, going past Five Islands.